Volkswagen has suspended nine managers suspected of involvement in the manipulation of diesel emissions tests that plunged the automaker into crisis. Investigations into what happened when, and who was responsible, continue and will run well into next year, the company said Thursday. 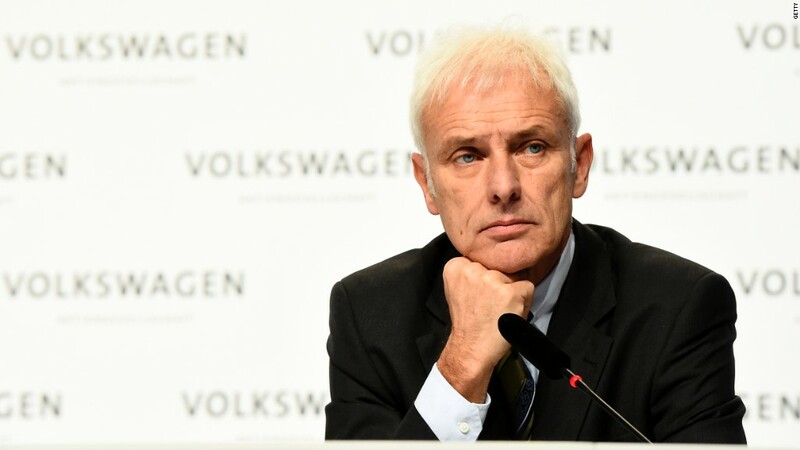 "We still believe a relatively small number of employees were directly involved in manipulation," said Volkswagen chairman Hans Dieter Poetsch. "I will not speculate on whether there will be further personnel consequences." He was speaking to reporters in Volkswagen's home town of Wolfsburg, Germany. Here are five things we now know about the company's efforts to get to the bottom of the scandal, and to fix as many as 11 million vehicles around the world. Some 450 experts are involved in internal and external investigations. Since news of the scandal broke, they've conducted 87 interviews, told 2,000 employees not to destroy documents and emails, seized 1,500 devices such as smartphones and laptops, and secured enough data to fill 50 million books. Volkswagen plans to provide an update on the external investigation -- being conducted by U.S. law firm Jones Day with support from Deloitte -- at its annual shareholder meeting in April. "Their findings must not only be plausible and consistent, but must also hold up in court," it said. It's already clear that the manipulation of diesel engines to make them produce less toxic nitrogen oxide (NOX) in tests than on the road was not a one-off error. Volkswagen describes a "chain of errors" that were allowed to happen, and has traced the origin of the scandal back to a decision to launch a big promotion of diesel vehicles in the U.S. in 2005. The automaker was unable to come up with a legal way to meet much tougher U.S. limits on NOX emissions "within the required timeframe and budget," so it deployed software to rig the tests. Later, when a technical solution was available, it was not fully employed. Still, the company continues to absolve the top executives and board of any responsibility. "There are no indications that the supervisory board or the management board was involved," Poetsch said. Some 12 weeks after news of the scandal first broke, Volkswagen doesn't have a fix for nearly half a million vehicles in the U.S. It said it was in "constant and intensive" dialogue with the Environmental Protection Agency and the California Air Resources Board, and was doing all it could to find a solution. VW can't issue a recall until it determines how it can fix the emissions problem. "In the next few weeks at the latest I would expect we will have an agreement that will turn into a recall, but we can't give any more details," said CEO Matthias Mueller. Volkswagen has already set aside 6.7 billion euros to cover the cost of recalls, but says it can't yet estimate the scale of fines, penalties and compensation. For that reason it's cutting back on any expenditure that is not absolutely necessary, and saying goodbye to the company jet. "Volkswagen does not need its own Airbus, so we will be selling the aircraft," Mueller said. Safe for now, at least, are the group's 12 brands -- including Audi, Bentley and Bugatti. "We are happy to have those brands, and there are no plans to sell any one of them," the CEO said. And despite a recent collapse in sales in some key markets, Volkswagen insists incoming orders across the group are healthier than it expected. It says they're up by 3.5% in the first 11 months of 2015, despite November sales declines in the U.K., France and Spain. The company will begin recalling and fixing cars in Europe in January, and aims to complete the work by the end of 2016. It also indicated that owners in Europe -- where some 8 million vehicles are affected - may be offered compensation for a decline in resale values. "We're working on the right package for each market. It will be an attractive package, let's call it compensation, for the loss of residual value," Mueller said.